Please take a look at the personal designer portrait of Hermann Zapf. 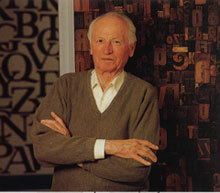 On 25th May 2010 Hermann Zapf has been awarded with the Order of Merit of the Federal Republic of Germany. Find some more details and photos here. Hermann Zapf died on June 4th, 2015 at the age of 96 in Darmstadt. Please read our obituary here.